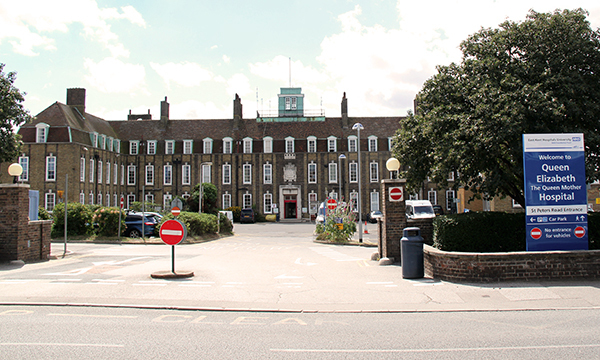 Two new reports by the Care Quality Commission (CQC) have revealed that East Kent Hospitals University NHS Foundation Trust was rated inadequate for children's services. Nurses routinely missed breaks, had no drinks and worked 'well beyond their contracted hours' at two hospitals where unsafe staffing levels put children at risk, according to health inspectors. Unannounced inspections in its children's departments at the William Harvey Hospital (WHH) in Ashford and the Queen Elizabeth The Queen Mother Hospital (QEQM) in Margate took place in October. No nursing staff on duty in the children's emergency department between 4pm and 2am, leaving patients to wait in the main ED. Some nurses carrying out duties without wearing gloves, while a locum doctor did not wash their hands or wear protective equipment when examining a child with chicken pox. Steps were not taken to separate children with potentially infectious illnesses from other patients and rooms had not been cleaned after patients had been examined. Wide-ranging concerns over cleanliness and hygiene, safety of patients, record-keeping, storing medicines and leadership. Managers and staff cited insufficient staffing as a risk. At WHH, staff said they worked beyond their contracted hours and missed lunch breaks due to 'unsafe staffing levels', and at the QEQM some told inspectors that they felt staffing levels were 'unsafe' so worked longer shifts to help. A chief nurse told inspectors one of the biggest risks facing children's services at the trust was recruiting and retaining staff who, it was felt, were often attracted to work in London instead. CQC deputy chief inspector of hospitals Nigel Acheson said it was clear that children's services at the trust have been working under some pressure, apparently with no end in sight, but would soon be in a position to remove conditions. It is also investing £250,000 to refurbish the oldest children's ward at WHH. The trust is one of the largest hospital trusts in England, serving a population of around 695,000 people. RCN England director Patricia Marquis said: 'This CQC report describes some troubling circumstances and the bottom line is it’s simply unacceptable that nursing staff have had to endure the pressure of working in such understaffed wards and in such pressurised conditions. 'We have been supporting members who have raised the issue of safe staffing at the trust for some time but ultimately it’s patients who suffer the consequences of this trust’s inability to roster sufficient workers to give patients the treatment they deserve. 'But this isn’t an isolated incident and if safe staffing isn’t taken seriously it’s likely we’ll see other trusts receive damning indictments from inspectors. In the last few months we’ve seen cancer wards closed to patients because of a lack of specialist nursing staff and now children’s emergency departments where no staff are available for several hours forcing patients to wait in the main A&E.